H&N Perry would like to extend a warm welcome to our new tenants, Instant Cash who have recently opened their doors at 314 Pinjarra Road, on the corner of Dower Street. You can’t have failed to notice their brightly coloured signs on such a prominent street corner and if you are wondering what’s inside, we recommend that you take the time for a look. Instant Cash is a family owned and operated business that provides the community with a cash lending service and is also a thriving pawn brokers with a range of quality items available for sale. As members of the FOSL (Financial Ombudsman Service Limited), Instant Cash pride themselves on responsible lending whilst still making the application process fast, easy and painless. You can even apply for a cash loan online and have a decision within minutes. 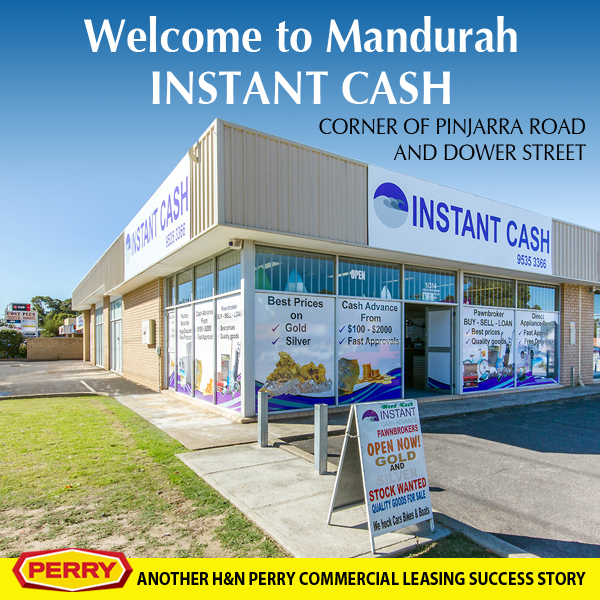 Instant Cash are providing Mandurah residents with a professional lending service and H&N Perry wish them every success with their business. The corner of Dower Street and Pinjarra Road is an ideal location for this business due to it’s high volume of passing traffic on a daily basis. There’s plenty of parking and easy dual access from both Dower Street and Pinjarra Road. The retail showroom is spacious with approximately 255sqm of floorspace available. The H&N Perry commercial department were responsible for arranging the lease agreement and also the professional management of the property. Our team has been Mandurah’s leading commercial property managers for over 65 years. We work hard for our owners and have closed over 12 new lease agreements so far this year. Don’t let your investment property sit idle, call Jan Wiley at H&N Perry on 9535 1822.